Read more about Heritage’s latest activities in the news! The long, strange trip to 557 Ashbury St.
How can cities save their small businesses? Malls of America: Can San Francisco’s solution to protect mom-and-pop shops help preserve the character of city neighborhoods everywhere? Carl Nolte provides an overview of the Campaign for San Francisco Heritage / Haas-Lilienthal House. Proposition J passes by winning 57 percent to 43 percent. J.K. Dineen’s collection of stories from the Legacy Bars of San Francisco is reviewed. “They have a very important part in the character of these neighborhoods, and unless the city makes an investment in helping them, they’re going to fail,” says Supervisor David Campos, who is sponsoring the legislation along with supervisors John Avalos, Jane Kim and Eric Mar. The work of preservationists and city officials to preserve local businesses is explored. Vancouver, B.C. looks to San Francisco as an example of how to preserve the city and mitigate a changing real estate market. Who Really Owns the Right to the Elbo Room? Like many other Legacy establishments, the owners of the Elbo Room do not own the building, and may be displaced because of it. Legacy Bars and restaurants are profiled. Is Historic Preservation Ready to Preserve Culture as well as Architecture? Heritage’s policy paper “Sustaining San Francisco’s Living History: Strategies for Conserving Cultural Heritage Assets” is discussed. On October 11th, Heritage co-hosted an event to teach preservation techniques for photographs, documents, and resources. Legislation is discussed that will create a Legacy Business Registry, along with incentives to help longstanding businesses purchase their building or extend their lease. San Francisco is constantly changing in many ways- one way being a high turnover among longstanding businesses. For 128 years the large house has stood at the intersection of Franklin and Jackson streets in San Francisco, and time has done little to diminish the beauty of the Queen Anne–style Victorian with its distinctive witch’s cap turret and its elaborate trim decked with flowers, garlands and sunbursts. As a boy, Francisco Camplis acquired a repertoire of songs that would have served him well in Dublin. Never mind that Camplis, now 80 years old, was the son of two Mexican immigrants in SoMa. Like his compadres he attended St. Patrick’s School on Fifth Street and every St. Patrick’s Day they learned three Irish songs. The Californian city’s Legacy Bars and Restaurants program is part of a worldwide movement, from Barcelona to Buenos Aires, to identify and protect places of social significance. Merchants, activists, city officials and community members of all ages gathered at a bustling corner of the 24th and Harrison street intersection on the afternoon of May 23 to celebrate a victory in the struggle to preserve the roots of San Francisco’s Latino culture. Considered the heart of the Latino culture, 24th Street has been designated the Calle 24 Latino Cultural District. Here’s today’s great idea: Let’s stop scorning the techies in our midst. San Francisco’s Mission District is the nucleus of the city’s Latino culture, boasting a rich history that began in the 1800s with Mexican land grants and the Gold Rush and continued in the 20th century with the Chicano movement, mural projects and the low-rider culture. It’s not often that the snobs of New York concede that provincial places like San Francisco best the Big Apple in anything. But the folks behind New York Neon Blog have a confession to make. Remember Waxman’s Bakery in San Francisco’s Fillmore District? Probably not, since it hasn’t been around for nearly 100 years. But now anyone can go back in time on Sourdough & Rye, a new online collection of historic photographs, videos and film clips, and see images of Jewish life in the Bay Area over the last 150 years. When Mike Buhler first heard last year that the owners of the Palace Hotel were trying to sell Maxfield Parrish’s “The Pied Piper of Hamelin,” he was loath to believe it. Five decades ago, the heart was ripped out of the Fillmore District and thousands of once magnificent Victorian homes were destroyed as part of an ambitious but ultimately disastrous attempt at urban renewal. Many of the scars remain today. Change is coming to Lower 24th Street in 2014, and, this time, it’s not gentrification. Rather, the stretch of 24th Street between Mission Street and Potrero Avenue is about to dig in and formalize its Latino roots. A community-led effort to turn Lower 24th Street into a protected cultural corridor will rev up this month. I’ve been on a quest recently. I want to find exactly what it is that ties the many complicated aspects of our heritage to our equally complex motivations to protect it. Rather conveniently, I’ve come to the conclusion that the answer may lurk in the corner tavern. Pencils raised, a group of 25 middle school students set to work sketching San Francisco’s 1898 Ferry Building, paying close attention to the waterfront structure’s Beaux Arts details. Today, the San Francisco Architectural Heritage organization inducted 25 new local bars and restaurants into their Legacy collection, joining the 50 San Francisco businesses already on the list. We see them every day, so much in fact that they blend into the streetscape, frequently beyond our notice. But when we stop to think about neon signs, their technology, and their history, we find fascinating stories that help us better understand our city. Creaking stairs, mysterious drafts, and flickering lights are year-round attractions at most historic houses. And there’s no better time than Halloween to celebrate those things that make chills run down your spine. After public outcry and six months of restoration, Maxfield Parrish’s The Pied Piper of Hamelin is back at the Palace Hotel for good. With a Champagne toast and a deep bow to more than a century of tradition, the famous Maxfield Parrish painting “The Pied Piper of Hamelin” returned to San Francisco’s Palace Hotel on Thursday. A modest new exhibition on historic preservation in downtown San Francisco discreetly touches on a much larger point: the need for the movement to contemplate its future as well as the past. SPUR, aka the San Francisco Planning and Urban Research Association, has been the driving force behind awareness-raising architectural and urban initiatives in SF since 1910. It’s still a resonant organization for Dwell‘s home city, and this month, SPUR’s publication The Urbanist, with the help of San Francisco Architectural Heritage, delves into a topic we can’t get enough of: new life for old buildings. San Francisco’s Marcus Books, billed as the oldest black bookstore in the United States, may be on the brink of closure. Supporters are rallying to save it. But can the city retain its historic and diverse businesses and institutions in the face of gentrification and rising real estate prices? There is only one thing that unites all of the various tribes of San Francisco, and it’s not the Giants. It’s a love of eating and drinking, and it seems to involve everyone in the city, from San Franciscans who have been here forever to those who just got here Tuesday. You know you are not in Kansas anymore when the guardian of your city’s heritage asks the citizens to help draw up a list of bars, dives, and haunts that have become part of the city’s cultural legacy. The famous Maxfield Parrish painting “The Pied Piper of Hamelin,” which has graced the main bar of San Francisco’s Palace Hotel since the bar opened 103 years ago, was taken down Friday and will be sold at auction. The owners of San Francisco’s Palace Hotel have removed the famous Maxfield Parrish Pied Piper painting that has graced the hotel’s main bar for over a century and plan to sell it at auction. In a city where the 264 official landmarks include City Hall, 23 churches and the Ferry Building, the latest additions to the list are two bars. The Haas-Lilienthal House was donated to San Francisco Architectural Heritage in 1974, but every December 24, descendants of William and Bertha Haas take out the one set of keys they kept and unlock the front door to 2007 Franklin Street. The boarded up Hibernia Bank building, a 19th-century architectural jewel that once housed one of the oldest banking institutions in San Francisco, is set to be brought back to life. Hundreds of cars zip along Franklin Street every day heading for the Marina district, for the Golden Gate Bridge and points north. It is a very busy street and driving along you might take a quick glance at the big gray Victorian on the west side of Franklin, just past Washington Street. San Francisco’s Haas-Lilienthal House, a structure steeped in Jewish history, was selected last week by the National Trust for Historic Preservation as one of 34 sites across the country to receive a National Treasure designation. The Haas-Lilienthal House has just been declared a “National Treasure,” an honor bestowed on the Victorian residence by the National Trust for Historic Preservation. Is a dollhouse from 1890 considered a recent acquisition? Yes, if this dollhouse just happens to be in a house built in 1886. Five painters are climbing nine levels of scaffolding to repair the weathered “MaestraPeace” mural that adorns the Women’s Building. Their brushstrokes are guided by bonds of art and friendship that they forged during its creation nearly 20 years ago. If the previous items didn’t convince you that the preservation movement takes many forms, consider the lineup of upcoming lectures being sponsored by San Francisco Architectural Heritage. Heritage Executive Director Mike Buhler discusses the significance of Pier 29 and the continuum of historically significant bulkhead structures along the waterfront. San Francisco Architectural Heritage presents “Spanning Space and Time,” a symposium on the Golden Gate Bridge. A historic skyscraper in downtown San Francisco, the Pacific Telephone & Telegraph building, empty for almost six years, is about to become a hub of construction activity as a $50 million-plus modernization project begins. “They are doing some pretty significant upgrades and making a major investment in the building to ensure its long-term preservation,” said Mike Buhler, executive director of Heritage, of the new plans. Gaul is one of about 50 docents who lead tours of the Haas-Lilienthal House, which was donated by descendants of some of the city’s most prominent families as a home for San Francisco Architectural Heritage, the historic preservation group. Marty had a small architectural practice, served on the Belvedere Tiburon Landmarks Society and on the board of San Francisco Architectural Heritage. Through Heritage she developed creative and popular programs for teaching San Francisco children about their architectural heritage. Her work was presented at a UNESCO conference and was written up in National Trust magazine. At 1235 Mission, on the south side of the street, is a three-story building with a flamboyant facade in bright colors – a Moorish design, like the Alhambra in Spain. In the best of times, San Francisco’s Architectural Heritage organization thought the building was worthy of landmark status. The Queen Anne-style Haas-Lilienthal House was, one of the most exquisite homes in San Francisco to survive the 1906 earthquake and fire. It was designed in 1886 by Peter R. Schmidt for William Haas, a prominent merchant of German—Jewish descent. Three generations of the Haas and Lilienthal families lived here until 1973, when the family donated the 11,500-square-foot house and most of its furnishings to what is now San Francisco Architectural Heritage. The Haas-Lilienthal House at 2007 Franklin Street is celebrating its 125th birthday by inviting neighbors to come by for a Free Community Day Tour on Sunday, October 23. As San Francisco’s leading historic preservation advocate, we have sought to dispel myths about historic preservation and highlight its undeniable benefit to our city while acknowledging that there are some legitimate concerns regarding how policies are implemented that need to be addressed. At its core, historic preservation is forward-looking. Preservationists believe we should carefully reflect before permanently discarding our historic places. This is not because we want the city to live in the past, but because we have our sights set on a brighter future. John Schmiedel Passionate connoisseur of food and wine, patron of the arts and animal welfare causes, accomplished architect, and dedicated preservationist of his native San Francisco, died peacefully on February 4, 2011 at the age of 72. Donations to S.F. Architectural Heritage. I know it’s only January, but here’s my nomination for Bay Area history book of the year: “Port City: The History and Transformation of the Port of San Francisco, 1848-2010.” As the title indicates, this self-published tome from San Francisco Architectural Heritage offers more than eye candy and break-bulk (non-containerized goods) nostalgia. Architecture, historic preservation, chamber music and jazz combine in benefit concerts in and for the Haas-Lilienthal House, which, with its gables and circular tower, is one of San Francisco’s most distinctive structures. 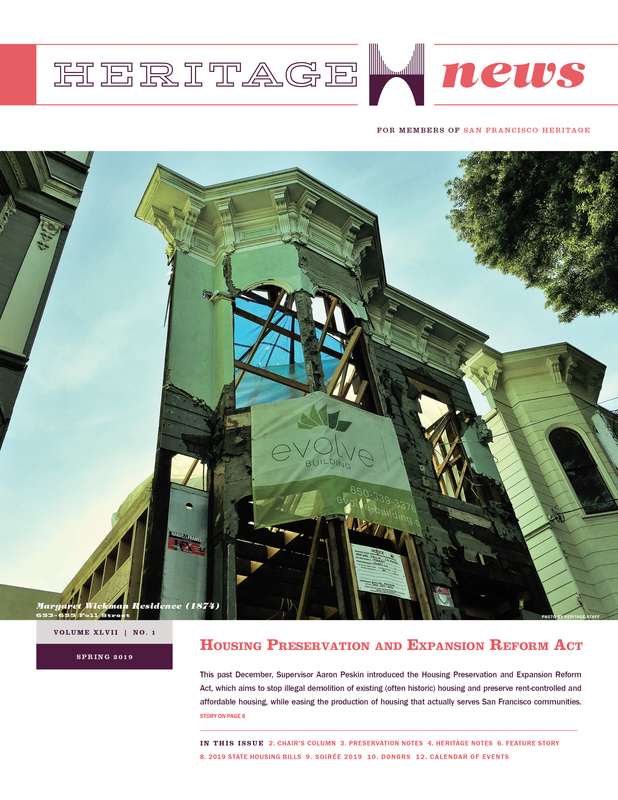 Preservation is just one mission of San Francisco Architectural Heritage, a nonprofit organization located in the building.